The last couple Saturdays have been holidays, so it was great to have the normal Saturday crew back in action today. Here is what our day consisted of. Our first treatment of the day was to nebulize 'Pleiades' (#17). 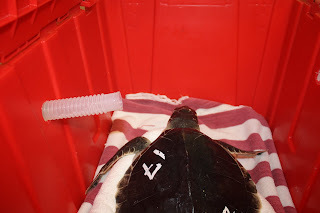 This Kemp's ridley sea turtle has pneumonia, so we use a nebulizer to vaporize his medications so that when he breaths it in, the medications have direct contact to the lungs. 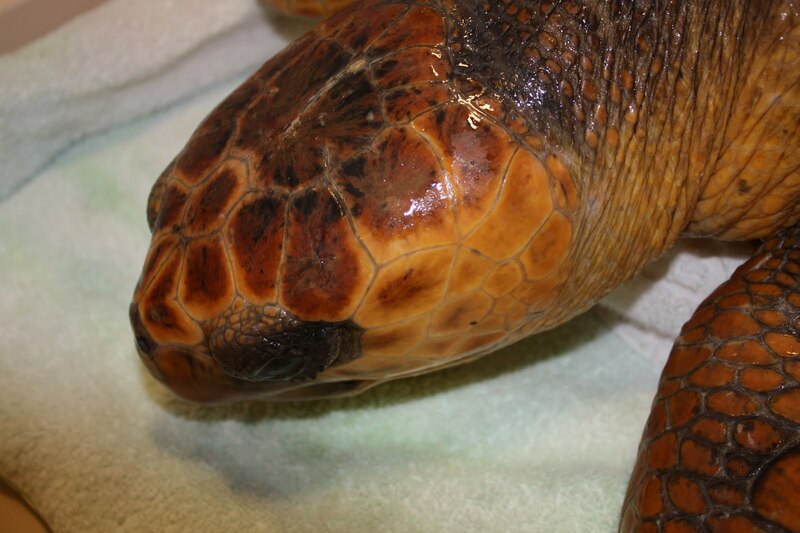 This turtle is also on oral antifungals and injectable antibiotics. You may remember past patients, including Orion from the 2008 season, being nebulized as well. We had several other treatments this morning which ranged from injections, blood draws, scrubbing a carapace (photo on left), and wound care. The photo on the right shows 'Centaurus' (#62) receiving his daily wound treatment. You can read about his previous surgery here. While treatments were happening in the clinic, other volunteers and staff were tending to tank maintenance. The above photo on the left shows Matt, the MSO, monitoring the water change of our 15 foot tank. In the photo on the right, MaryAnne, a long term Saturday volunteer, vacuums the debris from the 24 foot pool. 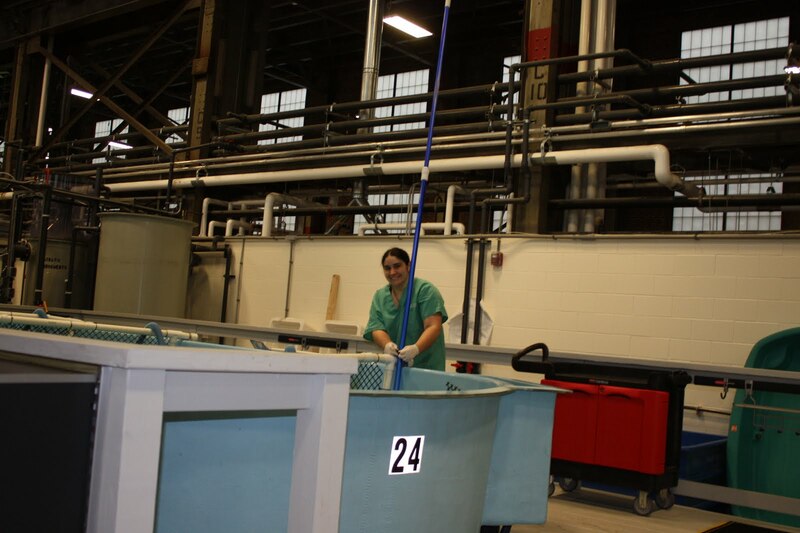 We vacuum all of our tanks several times a day to keep the water quality appropriate for all the turtles' recovery. 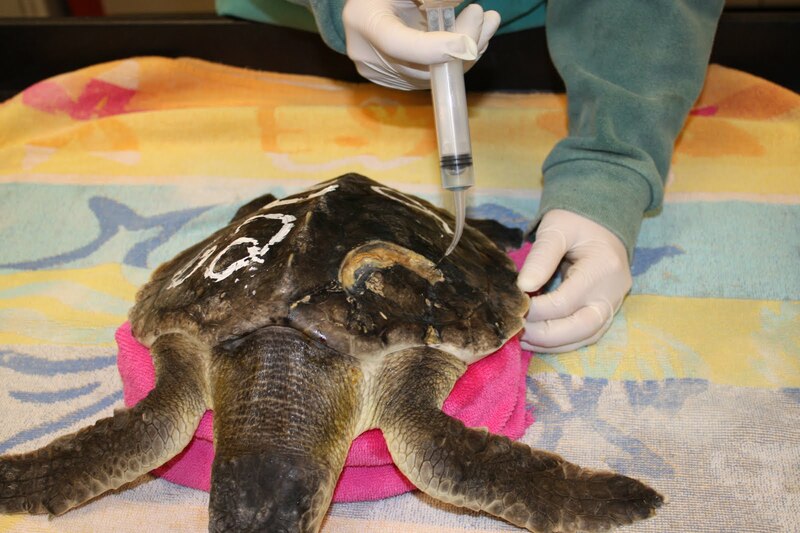 One of our last treatments for the morning is 'Pluto', our loggerhead sea turtle. I usually save him for last because it takes a little more effort getting him out of the pool and I like to save the best for last (I can't deny that loggerheads are my favorite species). 'Pluto' gets eyes drops daily to treat inflammation in one of his eyes. He also gets an injectable antibiotic daily, but we will switch him to an oral medication once he is eating consistently. 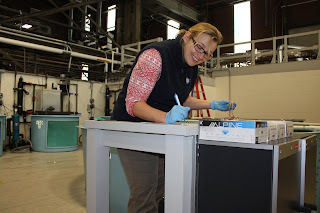 After treatments and tank care, feeding begins! 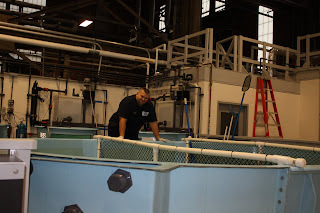 You can read about what it takes to feed the turtles in these posts here. In the above photo, Laura Dill puts tallys on the food chart with one hand while holding a squid head in the other while in the process of feeding turtles. Not only does she walk the beaches looking for turtles, but she volunteers her Saturday cutting up lots and lots of squid and herring for the turtles. You can read about Laura's efforts to help these endangered sea turtles here. 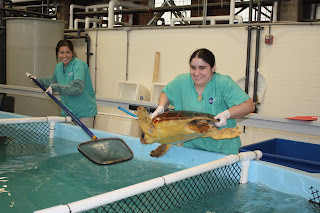 We provide some environmental enrichment for the turtles throughout the day as well. Most of the tanks have these pipes in them. 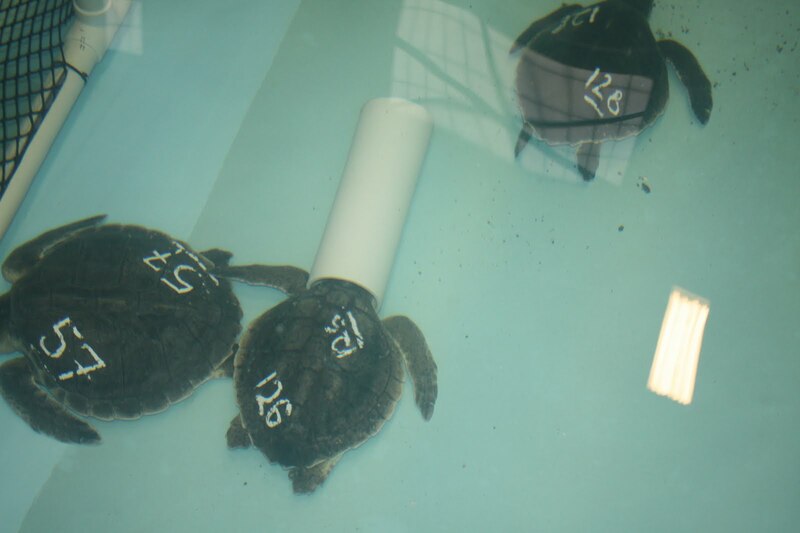 The turtles like to rest with their heads in the tube, as you can see #126 doing in the photo above. 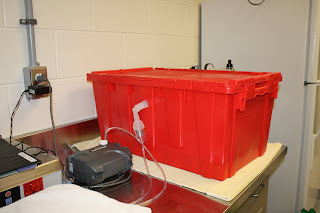 We also provide tactile objects for them, such as these car wash strips here, and other objects for them to hide under (read more about enrichment here). I'll write about the special thing we do for the green sea turltes tomorrow so remember to check back! All of this was just from the morning. 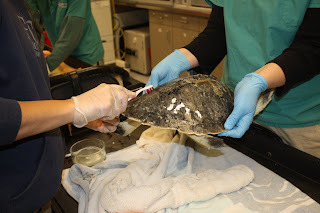 Our afternoon consisted of more feeding, tube feeding a turtle, veterinarian exams, and lots and lots of cleaning.